This is what screenwriter David Goyer recently told Empire Magazine about what the studio told him. I don’t think this will shock all that many people. Obviously the studio would want a big name villain for the finale of Nolan’s Batman trilogy. Aside from Catwoman, I don’t think there is another villain in Batman’s rogues gallery that has the name recognition amongst the general public. And the studio was killing two birds with one stone with DiCaprio. The actor has the star power they would want plus he has worked with Nolan before. And we all know how the director likes to work with the same people. Got to give the man credit. Nolan stuck to his guns and did not cave into studio pressure. Really, I’m not sure if I’m more impressed by Nolan or Warner Brothers for letting him do his thing. Then again, WB would have been idiots to force his hand with the suspicion that Nolan would walk if he didn’t see his vision out. 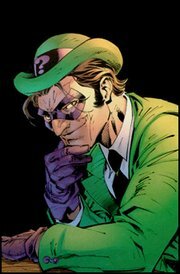 I certainly would have loved to have seen Nolan’s version of the Riddler, and I would have loved to see DiCaprio playing the villain. I guess I will have to wait for “Django Unchained” to see Leo’s bad side. You can’t help but believe that Riddler will undoubtedly be the villain for the next film. No Nolan in the director’s seat. No Christian Bale donning the cape and cowl. A new Batman universe (I would assume). The studio would want a sure thing with the popularity of the character. But will they be able to get a high profile star like DiCaprio to play the part? I guess we will have to wait and see who is directing. Side Note: This is my absolute favorite image of the Riddler. Partly because I love Jim Lee’s work on the “Hush” series. Partly cause I think it captures the personality of the character. Got a picture you think is better? Let me know in the comments below.